One just never knows what people are doing out there! Strange things happen behind closed doors, just ask Frances Glessner Lee. Lee founded the Department of Legal Medicine at Harvard in 1936. Of course, Lee didn't actually go to Harvard. In fact, being a woman, she was not allowed to go to college. Her wealthy father thought that schooling a girl would be a waste of money. Yes, Virginia, a hundred years ago you were not worthy of an education. So Lee did what women of that time did, she married and had a family and took an allowance from her father. Lee divorced her husband, and raised her children. In 1929, Lee lost her brother and over the course of the next few years her mother, one daughter and finally her father died. The family fortune was now in Lee's control. She promptly donated most of her fortune to Harvard to pursue her passion for legal medicine. She created a chair for her mentor, Dr. George Magrath, who had encouraged her. Now in her mid fifties, Frances Lee was able to pursue the interest that had been denied her for so many years. While Lee was "not busy" doing what she wanted to do, she acquired an unusual skill -- she began fashioning miniatures. She spent two months creating a replica of the Chicago Symphony as a gift to her mother, a longtime supporter of the symphony. She spent two years on an elaborate model of the Flonzaley Quartet, including tiny scores. 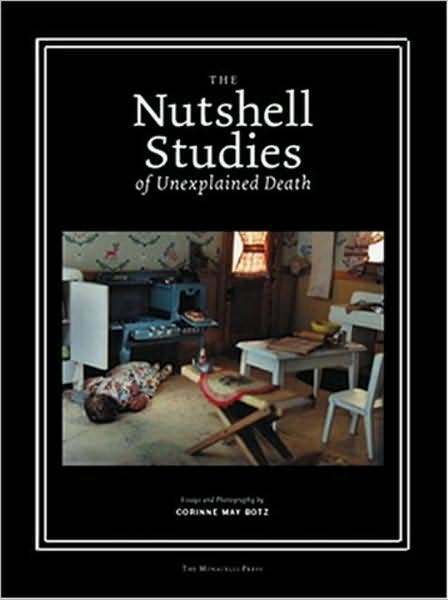 "The Nutshell Studies are not presented as crimes to be solved -- they are, rather, designed as exercises in observing and evaluating indirect evidence, especially that which may have medical importance." In total, there are eighteen dioramas in the Nutshell collection. Several years after her death in 1967, the Department of Legal Medicine at Harvard closed due to lack of funding. The Nutshell Studies were moved to Medical Examiner's Office in Baltimore. While this story is a fine one, a small historical footnote to law enforcement, it takes on another life. While Corinne May Botz was researching a movie on grown-ups with doll houses, she was alerted to the Nutshell Collection. So taken by the dioramas and Frances Lee, she photographed the collection and wrote a book about them. Someone at CSI clearly read Botz's work. For several season the CSI team tracked a killer known as The Miniature Killer, who sent detailed dioramas of her murder scenes, much like, oh heck, EXACTLY like Frances Lee's Nutshell Studies. I always thought the story of Frances Lee would have made a better story, now it seems that HBO and Guillermo del Toro have optioned Botz's book. In my imaginary movie of Frances Lee, I would cast Kathy Bates as Lee, but I am sure that in Hollywood they are floating around Lindsay Lohan! Wow, Lucindaville. I don't even know how I found your blog, but I am so thrilled I have. This story of Frances Lee is fascinating. I can't wait to explore more of your posts! i keep hearing about this wee museum, but you have to make an appointment to visit, and i haven't gotten round to it - yet.